This 34-story office building is perhaps the best building in New York even if its solitary prominence straddling Park Avenue was dashed by its immense neighbor, the MetLife Building across 45th Street. Its top is grandly elaborate chateau glory, a pyramidal jewel only rivaled in the city by the Crown, Woolworth and Chrysler Buildings. The east and west wings of its large base curve gently northward and are as comforting, in a city with a rectilinear street grid, as Motherhood. The base is not only exuberantly decorated with sculptures and a handsome clock over its entrance, but also has two pedestrian through-block arcades and north and south driveways, shown at the left, that make this the city's premier "drive-through" building. The lobby matches the stately elegance of the great roof. Its warm yellow, Jaspé Oriental marble walls and ceilings are accented by great cast-iron flourishes at each elevator bank entrance. These ornaments are emblazoned with the "NYC" logo, which stands, of course, for New York Central, the building's developer and operator of railroads. (The building's name was chiseled above its Park Avenue front entrance, but when the railroad gave up the building its new owners chipped away discretely to change the name above the entrance to the "New York General Building." When Harry B. Helmsley acquired it and decided on a very lavish, major renovation for the building, he gilded much of the sculptural ornamentation and changed the name on the front to the Helmsley Building, but in a consistent fashion with the original signage. Before the erection of the Pan Am Building, now the MetLife Building, this building was the city's dowager queen, lording it over the city's second most prestigious avenue and marking the elegant heart of the city as it was the tallest structure in the great "Terminal City" complex around Grand Center Terminal designed by Warren & Wetmore. A somewhat less flamboyant building modeled closely after this tower was planned by the architects to rise above Grand Central Terminal itself. The lobby's tall arch has about the same dimensions as the north and south driveway openings so that from a distance one is not aware of how ingenious the traffic plan here is for the roadways make two 90-degree turns within the building before bridging 45th Street and wrapping around the MetLife Building (see The City Review article) and Grand Central Terminal (see The City Review article), bridging over 42nd Street and ramping down to Park Avenue. The turns within the Helmsley Building separate true racecar drivers from New Jerseyites. The city's other great drive-through building is the Municipal Building, which straddles Chambers Street downtown, but its drive-through has long been closed, has no turns, and is primarily used by the brilliant city managers of the city as a garbage dump and executive parking. The straight through-block arcades in the Helmsley Building are quite large and well-lit, although Helmsley's renovation installed rather unattractive advertising vitrines that hopefully will be removed or upgraded in the future. For many years, the main shaft of the tower has illuminated many of its office windows to form a highly visible sign of a cross at night during the Christmas season. One could argue that religious partisanship is inappropriate, but New York's euphoria at Christmas time knows no bounds and this illumination is tasteful, attractive and relatively inoffensive. The elevator cabs have ceilings painted with clouds, which was appropriate when the building was erected as it towered over the uniform rooflines of Park Avenue that coincided approximately with height of the tower's base. 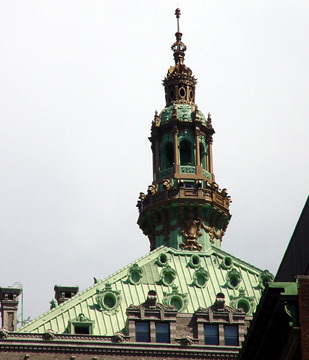 Beneath its lantern-bedecked pyramidal roof, shown above, the building has projecting columns, about four stories in height, that give it a slightly bulging and distinctive silhouette, a little reminiscent of the famous Singer Building on lower Broadway that was demolished to make way for the former U. S. Steel Building. The city has withstood the terrible onslaught of the automobile and this type of building inspired decades of utopian planners. In the summer of 1998, the building was sold by Leona Helmsley, the widow of Harry B. Helmsley, to Richard Kalikow. Hurrah for Warren & Wetmore and hooray for Harry B. Helmsley as this really was the centerpiece of his once vast real estate empire!